Click above to join Australia’s largest Windsurfing Club! 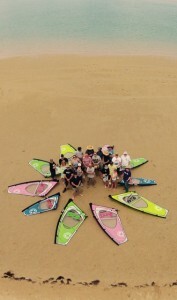 Inverloch Windsurfing Club was established in 2009 and aims to bring windsurfers of all ages and abilities together through recreational and social activities based around Inverloch, Victoria. The majority of our members are Melbourne based but enjoy the pristine waters of Inverloch. The Club has over 135 members from all over the state, with some members from Queensland and even New Caledonia! Membership can be Adult, Junior-family or Junior-individual. Junior-family is membership for a junior associated with at least one Adult membership (parent), and Junior-individual is membership for a junior who is not associated with any other Adult membership. A junior is anyone under the age of 18 on the first of July of the current season. PAID UP Members are entitled to attend the “Training Days” (3 – 4 per year) and “Mentor Days”(1 per Year) at no charge. Members receive all club communications and become an affiliated member of Australian Sailing. The benefits of AS membership include personal accident insurance- (details of which are outlined at http://www.networksteadfast.com.au/industries-and-associations/sailing/personal-injury-australian-sailing-members-insurance/ ). 1. Please register at Australian Sailing IWC membership portal. 2. Once you’ve filled in your details, you can then select your Membership type and payment method. 3. For a family, please register all members separately then send an email to membership@inverlochwindsurf.org.au This will allow your family members to be grouped as a family to allow you to update your family’s details from your portal login.